As well as the live TV channels, you have access to extra TV programmes, films, sport (from Sky Sport and ESPN), plus ‘catch-up TV‘. This on-demand content includes films, music, sports and kids programming, and is delivered over the Internet to your Vision+ box. The BT Vision box is a digital recorder that contains a hard-disk capable of storing up to 80 hours of TV programming. The box supports Live Pause and TV rewind. 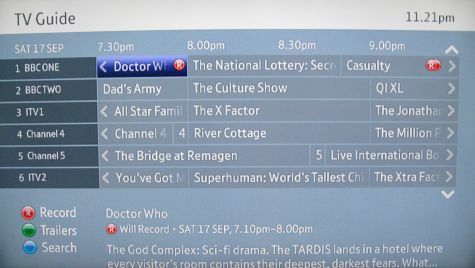 The BT Vision box has a 14 day electronic programme guide (with series link), plus access to the extra on-demand content via an on-screen guide. You will need a BT Vision set-top box – these are supplied to BT Vision subscribers. You connect it yourself – no engineer visit needed. There are two packages – The Essentials Pack, for £4 a month, or the Unlimited package for £12.50 a month. Details of the Vision packs. The BT Vision set-top box is connected to the Internet via the BT Home Hub. Once connected to the Internet, you can use the remote control to access “on demand” films, TV shows, kid’s telly, music videos and sporting events. You can pay per-view, or subscribe to viewing “packages. 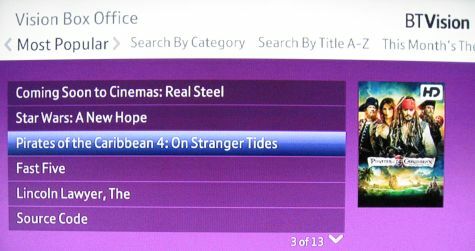 The BT Vision “on demand” service uses the Internet to get programmes that aren’t being broadcast live – think of it as a rental service, where you get TV shows and movies over the Internet delivered to your telly when you want them. Philips are manufacturing the BT Vision set-top box. The box can receive Freeview, holds up to 80 hours of TV, is HD-ready, and has a 14 day on-screen EPG (electronic programme guide). We have a review of BT Vision, if you’re interested in learning more about the service. We’ve also put together an audio review, that you can listen to online or on your MP3 player – You can find this on Show 12 of our Podcast. We also have a newsletter for existing BT Vision users to be kept up-to-date. Please see our BT Vision FAQ for answers to frequently-asked questions. If you have a question, please ask in our BT Vision forum. Ordering a BT Vision Box To use BT Vision, you need to be signed up BT Broadband – Prices start at £7.99 a month (for the first three months). Packages also include the BT Home Hub – this is a wireless router that’s needed for Broadband and to get the BT Vision service. Not got BT Broadband? Go to www.bt.com/btbroadband. More on alternative Internet TV and TV-on-demand on our IPTV page.